Hey folks! Usually it’s me (this is Shauna) tumbling the words onto the page. But Danny wanted to write this post, especially because we grilled a leg of lamb in a marinade he made, inspired by the flavors of the season. Take it away, Chef. Hi there! Chef here. Today I’m writing this post about lamb. Not just any lamb, but lamb that comes from the Anderson Ranch down in The Willamette Valley of Oregon. The Anderson family ranch has been around for five generations, producing lamb, and they sell to some of the best restaurants in Seattle. They make some damn fine lamb. You might be wondering about the difference between domestic lamb and Australian and New Zealand lamb. Traditionally, lamb from our friends down under was from a breed primarily meant to manufacture wool. (At least that’s according to Anderson Ranch. Some of you in Australia might have a different story on this. We’d like to hear it.) Here in the States, lamb is specifically raised for you and me to eat:) At Anderson Ranch, the lamb is grass fed, which allows the lamb to take its time to grow and not put on as much fat. Then there is the taste. For many years, Australian and New Zealand lamb was all the rage, but for me that lamb has a very gamey taste. Anderson Lamb has a much milder flavor and the gamey taste won’t take over your mouth. If you are feeling adventurous, take a stab at breaking down the lamb. (Excuse the pun.) Go for it! I’m sure there are some great instructional videos out there. (We might have to do one soon.) If not, you still can roast the leg whole and it will be just as good. Here, we’re going to grill the lamb in pieces. First, we’re going to make a marinade with pomegranate molasses, fresh ginger, garlic, Dijon mustard, fresh thyme, mint, balsamic vinegar, and olive oil. You might not expect to see these ingredients together, but these flavors dance very well together. They really complement the lamb. Make sure you get the lamb all lathered up:) Let it matinate overnight in the refrigerator. 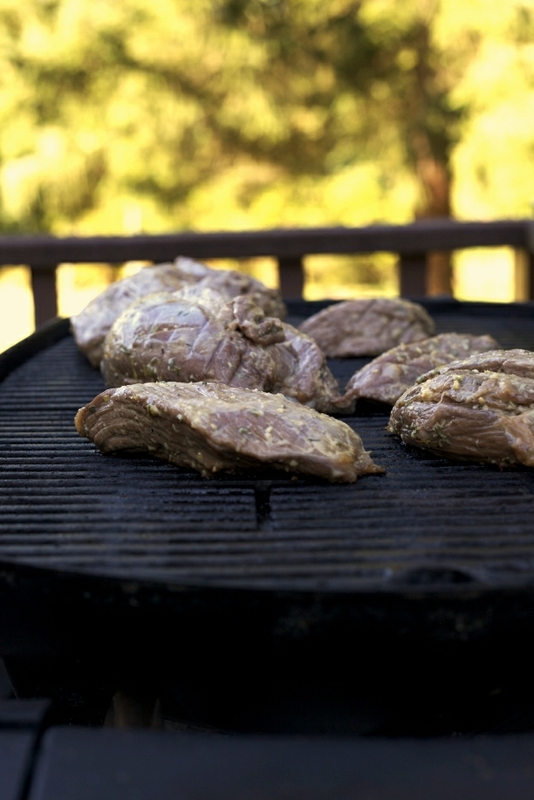 When you get ready to grill the lamb, don’t throw out the marinade at the bottom of the bowl. Use it to brush the lamb during the cooking process. Cook the leg to an internal temp of 140 to 150 degrees, then allow the lamb to rest off the grill (or out of the oven) for 10-15 minutes before you try to slice it. Let the lamb sit a little elevated on an inverted saucer so it’s not sitting in its own juices. This will allow the meat to release its juices in a nice slow process, instead of being FORCED out. It also allows the muscle to relax and the meat won’t be so tough. When you take the meat off or out of the heat, it will still be cooking on the inside. Better to err on the side of caution and pull it out a little underdone. You can always add more doneness to the meat, but you can’t take it away. 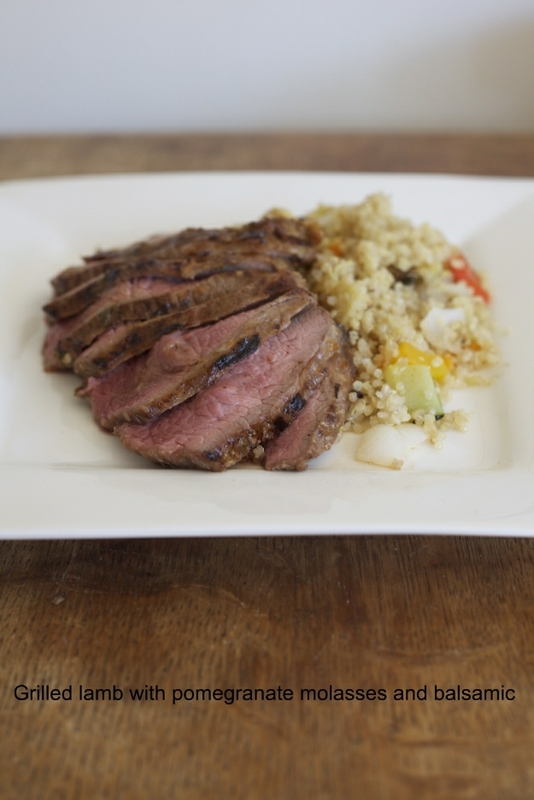 Here we are serving the grilled lamb with some lovely grilled summer vegetables and quinoa. Of course, this makes the entire dish gluten-free. It used to be the rule that lamb was only at its best during the spring (“Spring Lamb”), but with today’s ranching practices, lamb is available year round. This dish is for a 10-12 pound leg of lamb. 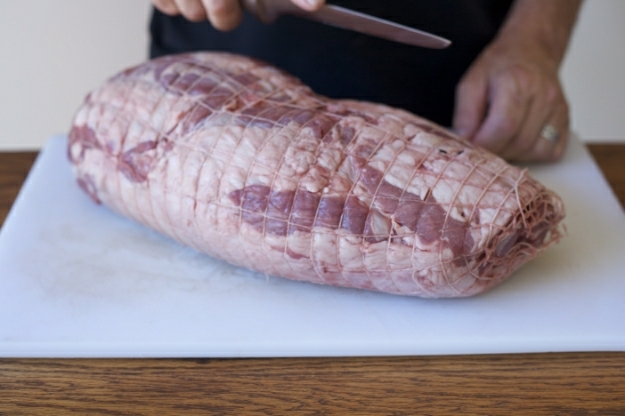 If you do buy a whole leg, you will have sufficient meat for either a large party or a good amount of leftovers. COOK:) It’s easier than you think. We were given this leg of lamb by the American Lamb Board. They asked 10 bloggers in Seattle to make up a new lamb recipe. There will be a competition later and the winners will be cooking with Seattle chefs. If you like this recipe, vote for it here! Preparing the lamb. Put the lamb pieces into a large bowl. Making the marinade. Combine the pomegranate molasses, olive oil, balsamic vinegar, Dijon mustard, garlic, ginger, thyme, mint, and pepper in a blender. Turn on the blender and run it until the ingredients combine into one smooth concoction, about 3 to 4 minutes. Marinating the lamb. Pour the marinade over the lamb pieces. Mix it up with your hands until each piece is coated. Cover the bowl with plastic wrap and let it sit in the refrigerator overnight, preferably for 24 hours. Take the lamb off the heat. Set a saucer upside down on a large platter and lay the lamb down on the sides of the saucer. Let the lamb rest for at least 15 minutes before slicing it. Roasting the lamb. If you don’t have a good barbecue, or you’re finding this recipe later in the year, you can also roast the leg of lamb. Make the same marinade. Slather it all over the leg of lamb. Refrigerate for 24 hours. Heat the oven to 500°. Put the lamb in a roasting pan. Put the lamb into the oven and set the timer for 15 minutes. Turn the heat down to 350°. 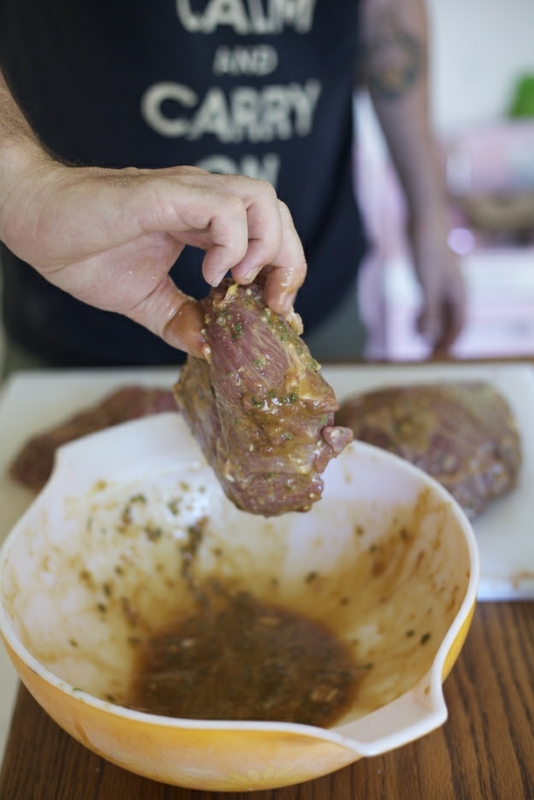 Brush the remaining marinade on the lamb occasionally. Roast until the lamb has reached an internal temperature of 140°. Let it rest in the same fashion described above. I’ve followed your Blog for several years with great delight …. until today. I am quietly outraged. I grew up on a New Zealand sheep farm. My grandfather and father produced top notch beef and lamb. Even today, in New Zealand, 90% or more of our animals graze open pasture with minimum interference. Today wool is not such a great income and much scientific research has been going on for years to produce the best meat in the world. I’m sure using American Lamb is your best option, especially when you know where it is grown but to suggest New Zealand and Australian Lamb is inferior is a mis-statement. The person from Anderson Farms who told you our meat comes from animals primarily bred for wool production is misinformed. I hope you will retract your statement. Your Blog is read by many people around the world and has some influence because you are a Chef. I am passing this on to people who are closer to the farming industry than I am these days. Hopefully someone will send you some helpful information to prevent any future blunders. And to show there are no hard feelings. I like your recipes. It was an opinion. I think he made it pretty clear that he wasn’t meaning to offend and he even said that he would like to hear from Australians and New Zealanders. I really don’t think there’s any need to retract his statement. And I am Australian. If the lamb he’s using here tastes better to him then that is his opinion. You are a master. You’ve got my vote! It is really nice to hear your voice Danny! I can’t eat lamb but Tina loves it and as long as I can cook it outside I am happy to so. The smell makes me gag and I just can’t stand the taste. So sad, because the the lamb in your photos looks delicious. Nice tutorial and well done and I will cast my vote. Most importantly I hope we hear more of your voice here. Mmmm! You cooked is perfectly. Medium-rare is just how I like it. MargieAnne, I’m glad you left your comment as I read the statement by the author about New Zealand lamb and found myself thinking ‘oh I must not buy New Zealand lamb anymore’. It’s amazing how much we take for granted that people who blog have an authoritative voice. I mean no disrespect to the author here, the recipe looks delicious, but just please make sure you check facts, as I know many people follow this blog and trust what’s written here. I must agree with the person above who took offense to the slap down on Australian and New Zealand lamb. Those two nations, especially New Zealand, are world renowned for lamb, beef and even venison. I find it difficult to believe thar they would not have bred animals to get the most quality meat possible. I think it would do justice to this blog if you could comment or compliment on something, such as lamb or pizza, without the need to denigrate something else. You can say it is a delicious lamb without ripping apart that of New Zealand. When you do this, you are not making the food sound better, but rather alienating part of your audience and damaging your credibility by sounding biased. I’m going to try to adapt this for the rack of lamb I was planning to make tonight to celebrate our 30th anniversary. My guess is that with this flavor profile, it will be delicious!! Great to hear from Danny. Any idea how many pounds of already butchered meat that is (roughly)? I might try it with some already broken-down cuts from our grass-fed meat CSA. Not sure how much of your 10 lbs unbroken down leg of lamb translates, and how much is bone that wouldn’t be counted in the pound total, you know? Your butcher, or the person behind the meat counter will be able to help you with that question. Have fun! We live in the mid Willamette Valley and are raising Hair sheep (StCroix) for meat. They can be bred anytime, are much leaner than wool sheep, and have a wonderful flavor even nonlamb eaters enjoy. It is a small herd (as we have real jobs ha ha) but this is our second year of new lambs…7 so far in the last 2 weeks. They lead a very happy life free to roam our 30 acres and they are a joy to watch. Danny was talking personally, not for everyone. Jeez. He is allowed his own opinion (actually a mild comment) on his own blog after all. If you were to give us the link, I’m sure we would vote for you 🙂 !!!!! Thanks for this post and another great recipe. I’m particularly happy to see that you’ve devoted some space to promoting domestic lamb – my family and I are some of those people, Chef, who raise that western (Wyoming produced, Colorado marketed) lamb you’re so fond of. Our sheep are dual purpose sheep, raised both for meat and wool. This combination of genetics is actually fairly common for domestic sheep producers, although you will certainly find U.S. sheep ranchers who specialize in producing wool, and those who focus more on meat production. In any case, I am very proud to also be a 4th generation sheep producer, and am so happy that domestic meat and fiber is able to compete with the excellent products from Australia and New Zealand that have dominated the market here in the States for so many years. I do appreciate and agree with some of the comments made by your earlier posters. Maybe I sound like a traitor for saying so, but Australia and New Zealand lamb and wool are great and for a long time those were the only products available in the stores. It seems like people are now trying to eat food that is raised/grown more locally, which means they’re discovering the virtues of domestic lamb and this is good news for me and my family. Thanks, Chef, for giving us a little plug. This recipe sounds amazing and I’m going to try it as soon as I can locate some pomegranate molasses! Thanks again! Oh dear, looks like you’ve opened a bit of a debate here! The recipe looks delicious, and one of my favourite ways to eat lamb is with a pomegranate and mint sauce, so I’ll give it a try for sure, yummo! I’m Australian, and I loooooove our lamb for sure, and I’m sure different environmental conditions affect the flavour of animals, and thus how much we enjoy eating them. I still love you for prefering your own lamb 🙂 I actually much prefer to source young mutton as that gamey flavour is my preference! What an interesting use of pomegranate molasses! A rather large bottle of the stuff has been taunting me from the cupboard since I purchased it months ago. Hope to break it out soon for this recipe! Thanks for posting. Fabulous chef! Thank you for the wonderful recipe. Going to vote, now! Lamb is usually on my “I don’t eat it” list, but this marinade has me totally enticed! What a lovely group of flavors!!!!! Hello Chef! I value your opinions. You’ve worked hard to educate yourself, to develop your palate, and to perfect your recipes. Your experience has only served to heighten your expertise, and we are grateful for the benefit of your thoughts. Thank-you for the humility I see in this post — the vulnerability and ease with which you invite others to engage — and for generously sharing your recipes and secrets with us over the years. Each of us has preferences. This is what drives the marketplace. We use discernment and opinion to govern every decision we make… we choose one brand of peanut butter over another; we strain to reach the top shelf where our favorite olives are kept; we scrutinize each apple before it goes in our basket. So, please… as a man whose preferences and opinions are born out of a lifetime of dedication to perfecting his craft, please continue to share with us what makes your taste buds happy. Simply gorgeous. I love the Willamette Valley, and you just gave me another reason to love it even more. Danny, how nice to hear your voice on the blog! I rarely eat lamb, but you make it look so good I’m tempted to have it soon. 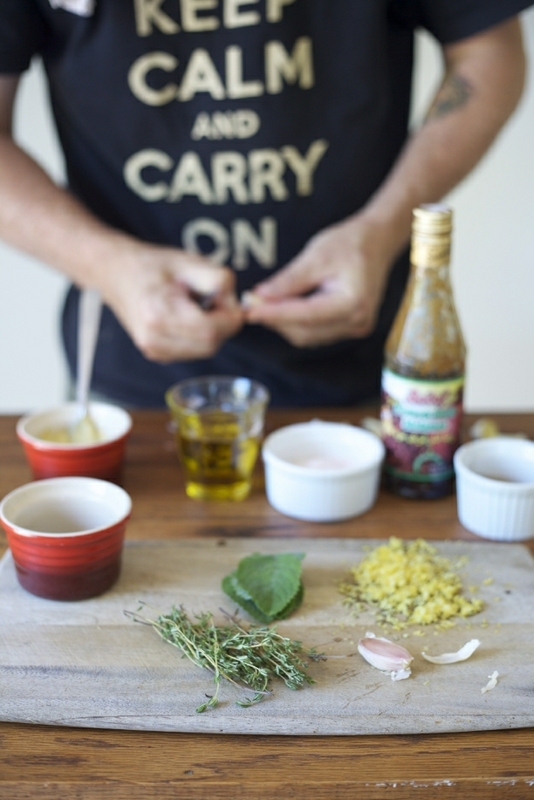 Thanks for the delicious looking marinade recipe and gorgeous photographs. You are obviously a trained and talented chef. I love your videos and your recipes. Don’t let the bitter words of others squash your talent or inhibit you in any way. Rejoice that your comments allowed someone to express their passon. I think you seem like a wonderful human being, husband, father, blogger. So keep on dude! We want more! ps: Ignore the negative comments. Lovely recipe- I’m going to try it this weekend! I wasn’t aware that Americans actually ate lamb – it hardly ever appears in American cookbooks. My family (Aussies) never ate it when I was a child in the 60’s as it was very tough and fatty in those days, but over the years has been developed into a delicious meat, possibly it’s because we now eat younger animals? So your comment could well be true – maybe in those days sheep farming was more about wool? I don’t know about the kiwis – they’ve always been big lamb eaters, so they most likely were more advanced than the Aussies! It’s always grass fed here and some also eat wild “salt-bush” which imparts a beautiful flavour. 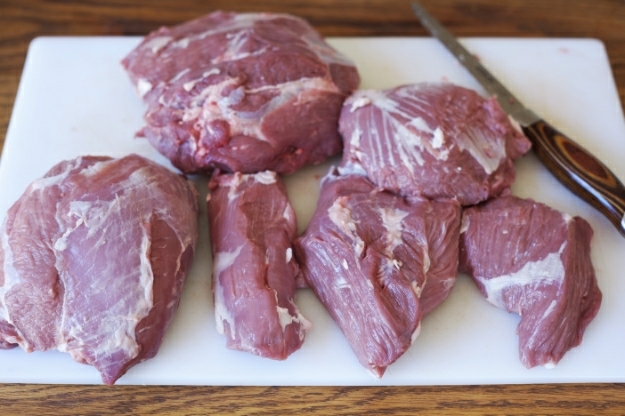 I think Americans should be eating American lamb – to cut down on food miles! I really like the idea of the pomegranate molasses in the marinade – this is going to get a tryout in our kitchen! I’m usually just cooking for two to four, but we do occasionally buy an entire leg, bone it out, and break it apart into smaller cuts for the freezer – it can make good economic sense to buy the larger pieces if there’s room to store the cuts. Weighing in on the lamb debate…I personally like both local (Washington/Oregon) and New Zealand lamb, but they are definitely different. New Zealand lamb has more fat and holds a noticeably stronger flavor than American lamb does, and sometimes that works out better with some stronger-flavored treatments. In practice, though, the majority of what goes onto our table comes from Ellensberg and Concrete – the local supermarket carries Ellensberg lamb, and we buy directly from a rancher who sells at the Edmonds farmers’ market. Interesting ingredients in your marinade. We usually just rub the lamb in salt & pepper and some rosemary. Will try marinating with your marinade. As you said you where interested in an Australian or New Zealander’s input, I thought I’d give you my experience with lamb. A disclaimer: I can’t and won’t say that I can speak for all of Australia and its lamb, my experiences are from growing up on sheep and cattle farms in Queensland and New South Wales (two states of Australia) and also my father’s knowledge about the subject, which is far greater than my own. I also won’t pretend to know all the great history of the sheep industry and I’ve never tasted lamb from outside of Australia. I love the combination of the balsamic & the pomegranate. i love lamb, but we have to keep it as a special occasion dish cause it’s so expensive when it’s in season here – but this maranade sounds so decadent i’ll definitely be trying this next spring, thanks danny!! I am a sheep farmer in Ontario, Canada and stumbled across your recipe. I’m always searching for new unique ways to cook lamb! The recipe sounds delicious but what the heck is pomegranate molasses? Can it be made at home? Lamb will definitely taste differently from different regions due primarily to the feed the sheep are being raised on. Different grains, supplements, and even pasture grasses can alter the flavour. It only makes sense that we love the lamb and local flavours that we were raised on! I’ve been a loyal reader for years; your blog is often the first I open each day, and has been incredibly influential in my every day meals. Its really opened up an appreciation for fine ingredients, and the power of flavour combinations instead of an overwhelming amount of basic spices. Unfortunately today, I am disappointed. Australia prides itself in it’s lamb, and it has been a primary product of agricultural industry. I can go to the butcher and feel proud of the quality of meat, and have faith in it’s history. Promoting local produce is definitely a key point of your blog. I think it’s important, and its something that I really value in your blog, as its almost like my mind travels to your local dishes. However, next time I suggest ONLY promoting your local produce, and promoting it for its own values instead of the comparison of others. Unless you’ve been to Australia and tasted the meat fresh from the paddock, your comparison has no back bone. Jess, we certainly didn’t mean offense. Goodness, people are more upset by this than anyone anticipated. Danny and I are both certain that Australian and New Zealand farmers are doing great work. However, as someone here commented, this is a taste/palate issue. Danny’s tastes are borne out of years of cooking food as a chef. He simply prefers the less gamey-tasting lamb available to us here. And it’s also entirely possible that the lamb we receive from Australia and New Zealand is quite different than the lamb you are eating there. (Strawberries eaten in California are pretty different than the California strawberries we eat in WA.) Danny stands by his statements as a chef. However, know that no offense was intended. Thank you Shauna and Danny. I admire that you stand by your word. I hope to hear more from Danny; I appreciate that this blog has grown from a girl with a gluten intolerance, to a family living a fresh new lifestyle. Interesting – I was raised on a sheep farm in New Zealand and have worked on stations in Australia where I ate a lot of lamb/mutton. Ram lambs or castrated ram lambs have a very gamey flavour compared to ewe lambs. It is not sold as ram or ewe lamb and without seeing the entire carcass it’s impossible to know the difference. I’m pretty sure the way they trim the carcass would mean that you can’t even tell from a whole chilled carcass. Do they differentiate in the US? Have you noticed a difference between flavour of ram and ewe lamb meat? Thanks for all the great recipes! I’m a newcomer both to the gluten-free lifestyle and to Colorado. We don’t have a lot of access to lamb in TX, so I’m excited to try this recipe and many of the others I’ve seen here. Please ignore the negative, comments. It’s YOUR blog, after all. I’ve met quite a few Aussies/Kiwis in my travels and found them to be cheerful & engaging … Never whiny. Not sure why your commenters represent the opposite. Thanks Danny and Shauna, that’s a very enticing series of photos. Reading through the comments, I don’t see negative comments as all. I just read Aussies and Kiwis defending their lamb, which is understandable. As a New Zealander living in Germany, I can appreciate both perspectives. NZ lamb is prized here and gladly promoted in restaurants. Despite that many Germans cannot eat it because they find the flavour too strong. Additionally, NZ lamb is expensive as it can’t take advantage of the generous subsidies that EU farmers receive. My advice to Americans is to eat American lamb if you prefer a milder flavour with your meat, and choose NZ/Aus lamb if you prefer something stronger. PS. The food miles argument is a nonstarter. If readers have geunine concerns about the enivornmental impact of their food choices, they need to under the entire supply chain. That is not easy to do, as you need to take many other factors into account.